Amazing Taste -- We spent years crafting the perfect cookie. This Oatmeal Raisin Cookie is a soft, chewy cookie with plump organic raisins and subtle notes of black pepper for a savory cookie to dig into. Make this the star of any kid's school lunch. 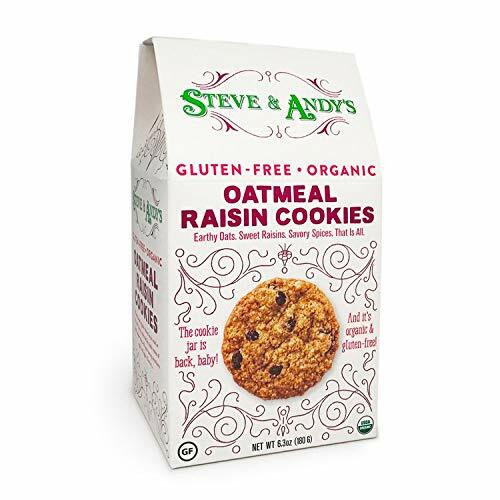 Organic -- Steve and Andy's believes in making the best cookies with the highest quality ingredients. We commit to using organic ingredients in our recipes to give you an amazing, organic cookie unlike anything you've ever had before. Allergy Free -- No peanuts, no tree nuts, no gluten, no junk. We removed many of the items people on restricted diets cannot consume ensure as many people as possible get to enjoy our tasty treats. These oatmeal raisin cookies are made for everyone. Find Your Sweet Spot! We created Chocolate Chip, Vegan Oatmeal Coconut and Vanilla White Chocolate to please all palates. Find the perfect cookie for you, your friends and your family in all of our delicious flavors sold on Amazon. All our cookies are organic and gluten-free. Money Back Guarantee-- We'd love for you to try our products with confidence. If this isn't the tastiest, guilt-free cookie you have ever tried, we will offer you a full and prompt refund. We extend this for sixty days post purchase, an offer you won't get from Amazon or any of our competitors.